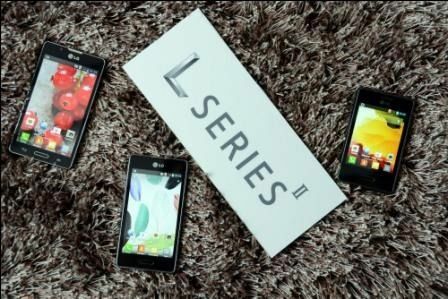 The Korean Smartphone Manufacturers, LG has announced the second generation of its much successful L Series Smartphones before the MWC 2013. The New Generation of the L series include LG L3 II, LG L5 II and LG L7 II. The information of the new series was leaked recently on the internet. LG has refreshed its L series to offer something new to its possible customers across the globe. The new LG L3 II sports a 3.2 inch LCD Touch screen and houses a 5 Megapixel Rear Camera. Whereas the LG L5 II sports a 4-inch Touch screen which produces a resolution of 480 x 800 pixels. LG L5 II is powered by a 1 GHz Cortex A9 Processor, supported by a PowerVR SGX831 graphic chip. It runs on Google’s android 4.1.2 Jelly Bean Operating System. LG L7 II sports a 4.3 inch 480 x 800 Pixels WVGA IPS Touch screen which is powered by 1GHz Qualcomm Snapdragon Processor, GPU: Adreno 203 and 768 MB of RAM. This smartphone also runs on Android 4.1.2 Jelly Bean Operating System. This Smartphone houses an 8 Megapixel of Rear Camera and 4GB of Internal Memory which can be expanded by using a micro SD card. It is fuelled by 2,460mAH Battery. There are no official reports about the pricing and the availability of the new L Series, but LG is expected to announce more details about these Smartphone at upcoming Mobile World Congress 2013, at Barcelona, Spain. These Smartphones will compete with Samsung’s Galaxy Series and HTC’s range of Android Smartphones.